At a Nov. 10 event held at the Kazakh embassy in Washington, DC, Company founder and executive chairperson Margery Kraus said her team and partnering organisations are humbled with the “honour to be selected for this responsible mission to set up the U.S. pavilion at Astana EXPO 2017” and are fully prepared to assume the task. She invited U.S. companies to rise to the occasion and join hands in order to make the pavilion a success. The key role of the exhibition is in further advancing strong partnerships between countries and providing a unique opportunity for American companies to demonstrate their latest technology innovations, said U.S. Assistant Secretary of State Nisha Biswal at the same event. She noted those goals have become possible thanks to broad financial support from private American companies interested in developing strong cooperative ties with Kazakhstan. 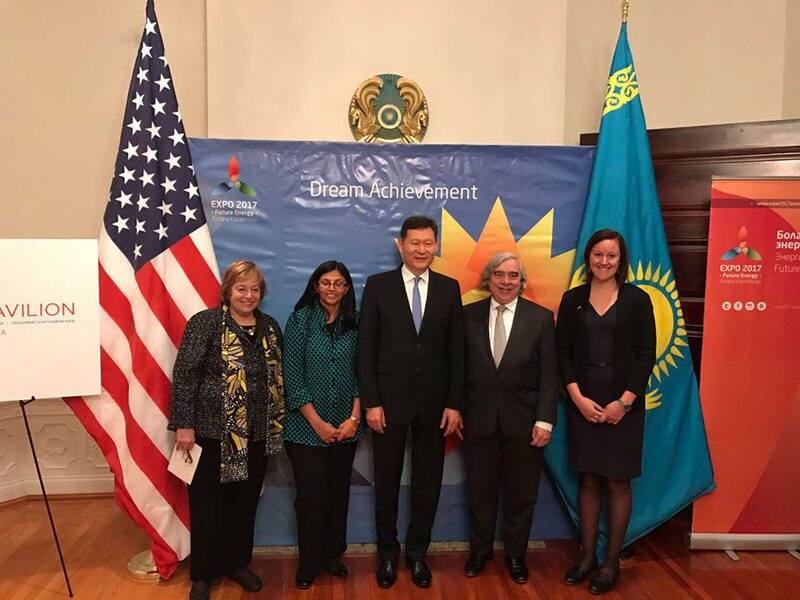 In his turn, U.S. Secretary of Energy Dr. Ernest Moniz praised the bilateral strategic partnership in energy, nuclear security and non-proliferation, emphasising Kazakhstan is an important partner in these spheres. He recalled his April visit to the capital and fruitful dialog with Kazakh leadership, expressing thanks for “legendary hospitality” and long-term vision of world processes. Drawing attention to the global trend in innovation development, Moniz noted the innovation focus of the exhibition and emphasised the relevance of the theme “Future Energy.” He announced his readiness to support the pavilion by presenting new American scientific technology. The United States-Kazakhstan Business Association partnered with the Kazakh embassy in organising the Nov. 10 event dedicated to U.S. participation in EXPO 2017. According to a Ministry of Foreign Affairs press release, the American pavilion has created a lot of interest among academics, diplomats and entrepreneurs. Kazakh Ambassador to the U.S. Kairat Umarov welcomed guests and addressed relations between the countries. 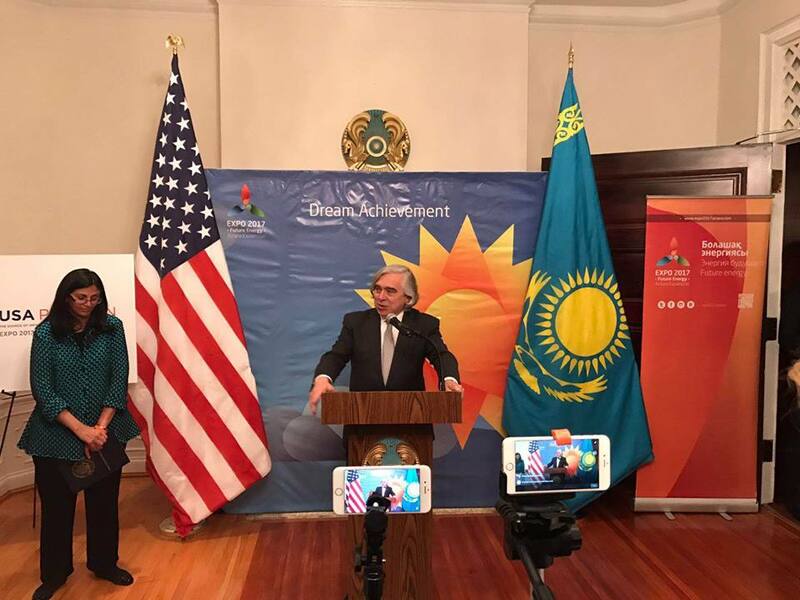 In turn, Moniz acknowledged Kazakhstan’s important role in the energy field and foresaw continued progress in Kazakh-U.S. cooperation in various areas. An official U.S. delegation led by Thomas Shannon, Under Secretary of State for Political Affairs, recently visited the Kazakh capital and toured the pavilion. He described the structure as “a beautiful building and a wonderful pavilion,” adding Americans will accelerate all procedures regarding the nation’s participation in the exhibition. EXPO 2017 will be held June 10-Sept. 10 and more than two million visitors generating five million visits are expected. To date, 105 countries have officially confirmed their participation and 101 countries have appointed commissioners.